PTCHits4u launched in 2011 as a simple $1 in, $1.50 out Ponzi scheme. The original business model finally collapsed earlier this year around May. A relaunch has since been announced, so today we’re taking a look at and reviewing PTCHits4u’s new compensation plan. PTCHits4u still has no retailable products or services. Advertising credits are bundled with affiliate deposits, which can be used to display advertising on the PTCHits4u website. PTCHits4u affiliates pay $1 a month to participate in a ten level matrix cycler. Matrix sizes used in PTCHits4u’s cycler are 1×2 and 1×3. A 1×3 matrix adds an additional position to fill. Commissions are paid once all positions in the matrix are filled. 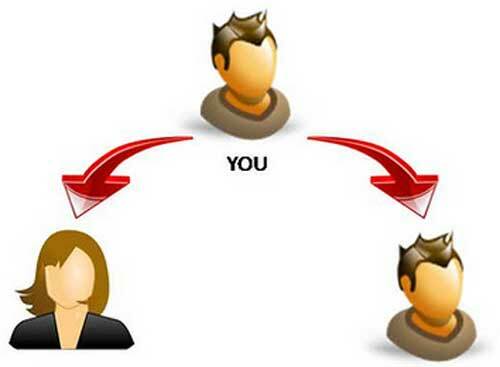 Matrix positions are filled as new and existing PTCHits4u affiliates purchase new matrix positions. Assuming a PTCHits4u affiliate has paid their monthly $1 fee, by clicking on 10 ads a day they can generate a new cycler position. Positions also appear to be purchasable for 10 cents each. PTCHits4u affiliate membership is $1 a month. PTCHits4u’s new business model is about as far as you can stretch a micro Ponzi. The basic math behind the scheme is 10 cents in, $30.30 out. Raw numbers you’re looking at 303 position purchases to generate a single ten-tier cycle. More once referral commissions and a $5 admin fee are factored in. As with the original PTCHits4u model, new affiliate investment is used to pay off existing investors. This sees PTCHits4u retains its fraudulent Ponzi nature in the reboot. As with the original model, once affiliate investment dies out PTCHit4u will collapse (again). Through preloaded positions and $5 of every tier 10 ROI paid out, there’s a good chance admin Neil Duffy (aka Neil Duff) will hold the only positions to cycle. At least in any significant manner, which in PTCHits4u’s business model is cycler tier 6 to break even. Bottom line? Same as any other Ponzi collapse, most PTCHits4u affiliates will lose money. Thanks for the updated reviews about PTCHits4u new compensation plan. About your quote: “…there’s a good chance admin Neil Duffy (aka Neil Duff) will hold the only positions to cycle.” Isn’t true because all my positions at Level 1 have cycled and netted me $0.24 in the cash balance and $0.90 in the repurchase balance to use for the upcoming launch of Level 2 tomorrow. Not bad just for just clicking 10 ads. Oh and by the way, the $1.00 month subscription is required to withdraw but not required to start. A person can now click the 10 ads and get the $0.10 then buy a Level 1 position without any out-of-pocket money. When a person completes Level 6, the person may buy the monthly sub then and withdraw earnings from Level 7 thru Level 10. Will continue to update my progress. So what part of “likely” did you not understand? Furthermore the context of “cycle” in that sentence refers to a complete ten-tier cycle. You yourself confirmed you’ve only cycled on level 1. Well, that’s because only Level 1 has launched so far. Levels 2 through haven’t launched yet. The admin is only launching one level a week at a time. After tomorrow, Level 1 and Level 2 will be active. I understand “likely” very well. Yeah no worries chief. You keep believing positions haven’t been pre-loaded on every level of the matrix. I believe that there are pre-loaded positions on every level of the matrix, chief. I just thought you would like a perspective of PTCHits4u from someone actually in the program. Why? A matrix cycler is a matrix cycler, they’re all the same. Whether you’re in one scamming others is neither here nor there. The only difference in perspective is reality vs. someone trying to take your money. PTCHits4u hasn’t taken a penny from me. My only cost was the time to click and view 10 ads. But, you’re right a matrix cycler is a matrix cycler. Just looking at the 10 levels sounds like a waste of time. I can make more just selling a few items I buy for pennies. Interesting thing about this is it will fool enough people into thinking they can earn big money for so little invested. While they have taken the bait to fill the owners pockets once again.